Even though Glo is the undisputed king of poor and unreliable network in Nigeria, you can still take away the fact that the mobile operator always have great deals that just always make thier customers come back for more. Glo has just recently announced two new bonanza packages which they call the Glo Everyday Bonanza and Glo Jumbo SIM. 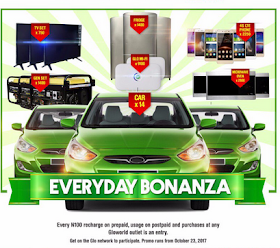 The everyday bonanza will reward 50 lucky Glo subscribers with free LED TV sets every Monday (a total of 750 TV sets), 150 4G LTE enabled smartphones every Tuesday (a total of 2250 4G LTE phones), 100 generating sets every Wednesday (a total of 1400 generating sets), another 100 refrigerators every Thursday ( a total 1400), 200 Microwave ovens every Friday ( a total of 2800 microwaves), 650 4G LTE Mifis every Saturday (a total of 9100) and 1 Hyundai Accent to a lucky subscriber every Sunday (a total of 14 cars). 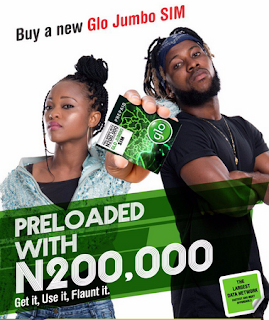 With the Glo Jumbo SIM which cost just 100 Naira, Glo customers will be automatically rewarded with airtime value of N200,000 pre-loaded on it, and will be activated as soon as the subscriber recharges his or her phone. Let me know what you guys think about this mouth watering offers in the comment section below. Personally, I really love the affordable Glo data plans and amazing promotions, but I really think Glo needs to invest more on their network reception to provide a more better network reception for those customers. Don't forget to kindly share this post on your various social media platforms and also subscribe below to be updated with the latest posts from this blog.